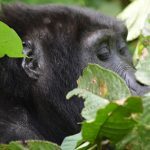 The mountain gorillas (Gorilla Gorilla Berengie), the world’s most endangered ape, is found only in small portions of protected afro Montane forests in northwest Rwanda, southwest Uganda, and eastern DRC. 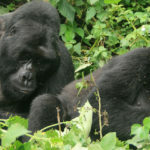 The mountain gorilla is one of many species unique to these forests. The forests are also home to many wonderful birds, primates, large mammals, reptiles, insects, plants and also ensure continued water and medicinal plant resources for the local communities. Hidden high among the forested volcanoes of East Africa, the mountain gorilla was unknown to science until 1902, when two were first encountered by a German explorer and promptly killed. It set the tone for the relationship. 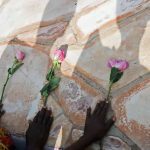 For much of the time since, due to deforestation and poaching, it has seemed that the mountain gorilla was swiftly destined to be lost to the world again. Not long after the species’ greatest champion, the American zoologist Dian Fossey was killed in Rwanda in 1985-there were fewer than 300 of the giant primates left in the wild. Today nearly half of the world’s 700 remaining mountain gorillas live in the Virunga Mountains of central Africa, at the intersection of Uganda, Rwanda, and the Democratic Republic of the Congo. The volcanic slopes here are lush with tropical forests and diverse mammal, bird, and reptile species but they are also at the heart of a region in crisis. Gorillas can climb trees but are usually found on the ground in communities of up to 30 individuals. These troops are organized according to fascinating social structures. Troops are led by one dominant, older adult male, often called a silverback because of the swath of silver hair that adorns his otherwise dark fur. Troops also include several other young males, some females, and their offspring. The leader organizes troop activities like eating, nesting in leaves, and moving about the group’s 0.75-to-16-square-mile (2-to-40-square-kilometer) home range. Mountain gorillas have longer hair and shorter arms than their lowland cousins. They also tend to be a bit larger than other gorillas. Those who challenge this alpha male are suitable to be frightened by impressive shows of physical power. He may stand upright, throw things, make aggressive charges, and pound his huge chest while barking out powerful hoots or unleashing a worrisome roar. Despite these displays and the animals’ obvious physical power, gorillas are generally calm and nonaggressive unless they are disturbed. Female gorillas give birth to one infant after a pregnancy of nearly nine months. Unlike their powerful parents, newborns are tiny weighing four pounds (two kilograms) and able only to cling to their mothers’ fur. These infants ride on their mothers’ backs from the age of four months through the first two or three years of their lives. While planning your Rwanda safari, one should not miss out on the magnificent opportunity to visit Rwanda’s Volcanoes National Park consisting of 125 km2 of mountain forest and home to the six Virunga Volcanoes and the world famous mountain gorillas. 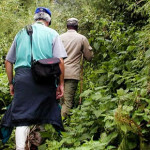 The lushly forested slopes of the mountains form an appropriately dramatic natural setting for what is arguably the most poignant and memorable wildlife experience in the world: gorilla trekking. The exhilarating climb to the gorilla’s natural habitat of shady bamboo forest offers fantastic views in all directions before the trackers are immersed in the mysterious intimacy of the rainforest, alive with the calls of colorful birds and the chattering of rare golden monkeys. 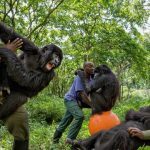 Nothing can prepare one for the impact of encountering a fully-grown silverback gorilla, up to three times the size of an average man, yet remarkably peaceable and tolerant of human visitors. 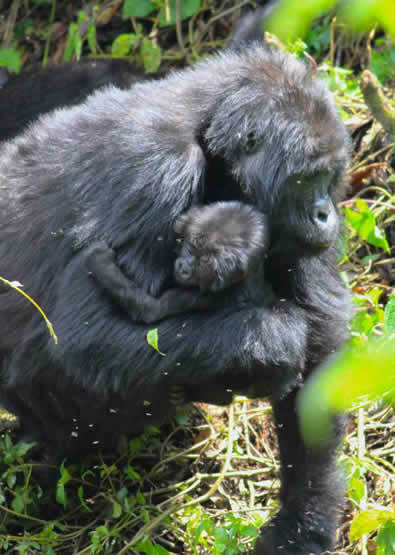 With the help of dedicated wildlife rangers, comprehensive monitoring, and community education programs, the endangered gorilla population in the Virungas experienced a nearly 20 percent increase in the early 2000s. 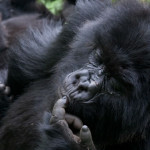 But in 2007, at least ten gorillas in Virunga National Park were lost to murder and chaos. 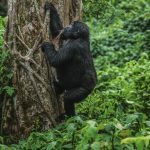 Gorillas in other Virunga parks are faring a bit better, as is the other half of the world’s remaining mountain gorilla population, which lives in Uganda’s Bwindi Impenetrable National Park, just 24 kilometers north of the Virunga mountains. Many conservation initiatives are meant to aid mountain gorillas, and it is believed that their numbers may be steady or slowly increasing. Still, they continue to face major threats from habitat loss and poaching. 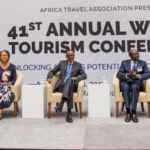 Efforts to change attitudes towards the mighty animals have seen them become an important source of income for the local economy through the tourists they bring and turned poachers into vocal advocates for conservation. By following these rules and through the purchase of the permit, you too are contributing to the conservation of the mountain gorilla. The funds generated from the sale of this permit are used for the management of the National Parks. A percentage of the funds raised from Park entrance fees are also donated to local communities living adjacent to the parks to contribute to their development and improve natural resource management in the region.